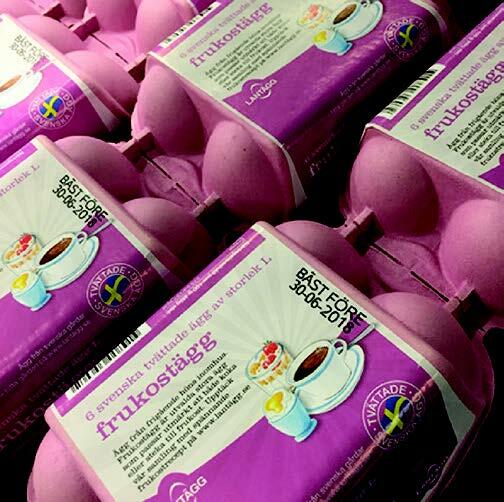 Washing, sorting and packing 1.5 million eggs a day, DAVA Foods Sweden runs 17 production lines within their fully automated processing facility in Skara. The company was using label print-and-apply technology to imprint and tamp self-adhesive labels marked with “best before” codes on top of their egg packs. The system, however, required frequent downtime for restocking of labels and removal of the waste paper backing. It also required operators to change the messaging manually according to each product run, a process prone to errors and subsequent rework. To minimize packaging costs, downtime and errors, the company looked for a new marking and coding solution. 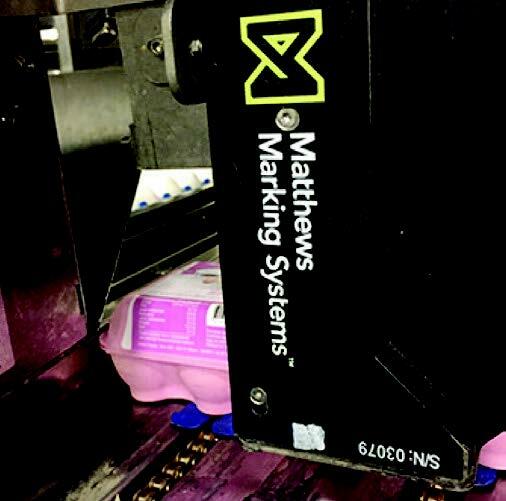 Matthews replaced the label printer/applicators across all 17 lines with 25 easy-to-use VIAjet™ L-Series thermal inkjet (TIJ) with 0.5-inch tall printheads. Eight of the lines are equipped with two printheads, allowing DAVA Foods to run both 6- and 12-packs on the same line. The system marks the variable “best before” code directly on top of the egg packs at a high print resolution (600 x 600 dots per inch) for maximum clarity, and reaches speeds up to 1,200 feet per minute. It also starts up and shuts down in seconds to minimize downtime. For gentle handling and to accommodate the height variations of the different egg packs, each printhead is attached to the line with a spring-mounted stand. Because the VIAjet™ L-Series utilizes cartridge-based ink supply, it is inherently clean and nearly maintenance-free—no labels to replace and no paper backing waste to remove. Instead, an operator simply replaces the cartridge to refill the ink supply, a process that takes 10 to 20 seconds. Inserting a new ink cartridge also removes the potential for clogs or spills, eliminating downtime required for cleaning. By replacing the label printer/applicators with Matthews’ MPERIA®-driven VIAjet™ L-Series TIJ system, DAVA Foods significantly reduced their packaging costs by eliminating the time and expense associated with handling the labels. With the L-Series’ cartridge-based ink supply, the company can now mark 120,000 packs per printhead before requiring a cartridge change. Additionally, with the simple-to-navigate MPERIA® system, operators can easily set up and edit manufacturing date and lot codes with minimal training, significantly minimizing errors.